Wow!!! Even though we’re now living in the age of music being freely available, I’d never ever imagined a band like U2 would actually stream a performance live. In fact, when I first heard about it, it seemed too good to be true, and I headed over to the site still thinking it was some kind of hoax. However, lo and behold, it was true, and though initially the quality was pretty bad, it improved considerably later on. Fans across 16 countries, including the US, UK and India watched the Irishmen perform live at the Pasadena Rose Bowl in California. 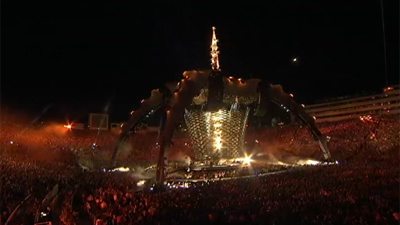 Almost 96,000 fans attended the event, with an estimated 7 million watching it live on YouTube. The band had disclosed last week that they had entered into a tie-up with YouTube to do this.